Writing is a totally new type of activity for children entering school. Most children have considerable difficulties learning to write. Doctors, physiologists, and psychologists explain this by the fact that children’s weak finger and wrist muscles get tired quickly and that children are also fatigued by the monotonous work of tracing out letters. As a child becomes more tired, his wrist movements become increasingly erratic: sprawling or, on the contrary, very small. Fatigue is often accompanied by problems with visual-motor coordination. The present skill-trainer can help children with developmental problems to avoid difficulties. A good way to begin to acquire writing skills is to learn how to hold a pen or pencil correctly. The skill-trainer will help to teach children with developmental problems the right finger position quickly and easily. The skill-trainer will also help children to develop their personal handwriting style (the handwriting style is a stable style of writing, i.e., a system of habitual movements expressed in writing and based on a writing-motor skill). This skill-trainer is a simple device that helps a child with developmental problems to learn the correct way of holding a pen or pencil when learning to write. This device makes it easy and convenient to hold a pen properly yet impossible to hold it improperly. It will be particularly useful for children with disorders of fine wrist motor skills as well as children with cerebral palsy. All the skill-trainers were tested with pre-school and school children. The practical relevance of these skill-trainers is that they can be used for enhancing psychological, pedagogical, corrective, and preventive work at special education schools. Skill-trainers for using pens, pencils, and spoons were tested in Kindergarten #1,790. These trainers help children to develop correct skills of holding these instruments in their hands. The skill-trainers Write-It-Right and Write-It-Left were tested in our kindergarten’s senior groups. 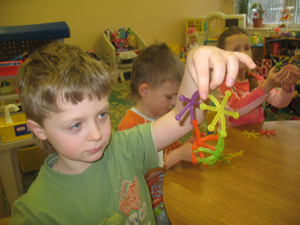 Children had a positive reaction to the trainer, which is soft and colorful and depicts something fun and friendly. 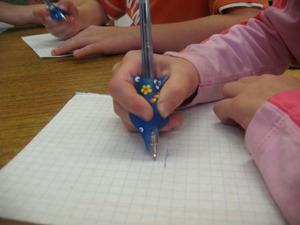 The trainer made it more comfortable for children to hold a pen or pencil during writing and drawing. Left-handed children found it more comfortable to hold a pen than right-handers. Usually children put a pen down on the table after writing for 5-7 minutes and make movements with their fingers, which is a sign of fatigue and tension. This takes place at the level of the anti-overload reflex. The pen or pencil was held stably. While it was in the child’s hand, he held it correctly and did not attempt to change the position of the fingers. 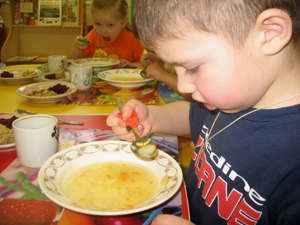 The skill-trainer Witty-Eating Spoon was tested in our kindergarten’s junior groups. Children found the skill-trainer appealing and used it with pleasure. The image on the trainer has a fun and educative aspect: it’s friendlier and more fun to eat with a bear. The spoon was held stably and with greater comfort. 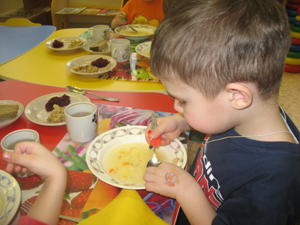 Certain children needed only a few days to learn to hold a spoon correctly without the trainer using motor memory. The material is safe when it comes in contact with food and the child’s skin. It can be washed and sterilized without fear of deformation. The Witty-Eating Spoon trainer fits spoons of different sizes. 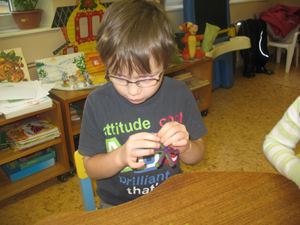 Inventor is a universal construction set that is great for developing intellectual construction skills among children. It is light, portable, and compact and offers an unusual method of joining pieces. The innovative snowflake shape of pieces allows children to model different objects from geometric structures to figurative toys. Inventor belongs to the skeletal type of construction sets that are rarely used in kindergartens, although they are wonderful for stimulating children’s intellectual alertness, logical thinking, and combinatorial skills. According to parents, this bracelet is convenient to use and relieves wrist stress. 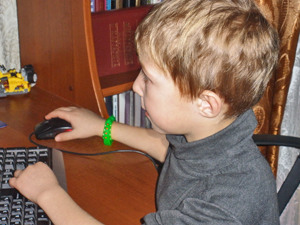 A child can spend 15-30 minutes before a PC without taking his hand off the mouse and without any visible signs of fatigue. In contrast, he begins to shake his hand after 5-10 minutes or so if he doesn’t use the bracelet. In April-May 2005, the Office of Education and Science tested ergonomic devices developed by Vladimir Karpychev: a bracelet for working with a computer mouse and keyboard; skill-trainers for holding a pen or pencil correctly when writing or drawing; a skill-trainer for learning to hold a spoon correctly; and a skill-trainer for learning to use chopsticks in order to develop fine manual motor skills. The devices were tested in three schools. Up to 100 devices of each kind were used during the tests. The test results for all devices point to their great effectiveness. All of the devices meet pedagogical standards and help pre-school and school children learn to write and to hold a spoon and develop fine manual motor skills more quickly. We would like to draw attention to the devices’ great artistic and technical merit, which makes it possible to obtain positive results over a shorter period of time in a fun way. We believe that it would be expedient to augment the use of these devices in the educational process at educational establishments.